In Causeview an organization-wide (or org-wide) email is the address that email receipts are issued from. Part of the initial installation and configuration of Causeview includes selecting an email address and contact name to use for emailed receipts. When constituents give gifts to your organization, any emailed recognition and documentation of that gift will feature the name and email of the org-wide email you choose in the “from” field. That means that the name and email you choose should represent the face of your organization and should not appear to your constituents to be a “spam” address. Depending on your organizations needs, you may wish to use the name of an individual representing your organization, or simply the name of your organization with a general email address, such as “info@yourorganization.com”. It must be an email you have access to, in order to verify the address. While it is possible to set multiple org-wide emails in the system, only one default address will be used by Causeview to generate automated receipting emails. Once you have chosen your email address and the name that will appear in the “from” line for your organization’s correspondence with constituents, you can proceed with setting up the organization-wide email in Causeview. 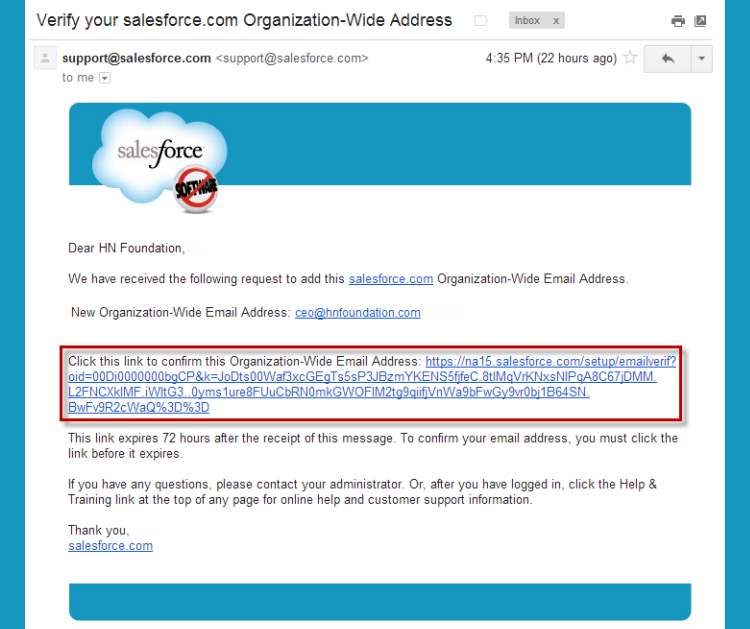 To add the org-wide email address you have chosen to Causeview, log in to Causeview at https://login.salesforce.com using the user name and password of a System Administrator account. Once you have logged in and you are viewing the “Home” tab of Causeview, you will have to navigate to the “Setup” menu. To do so, find your username in the top right of the screen with a downward pointing arrow next to it, and click to open a drop-down menu. Within the drop-down menu, click on “Setup”. The administrative Setup page for Causeview will open. 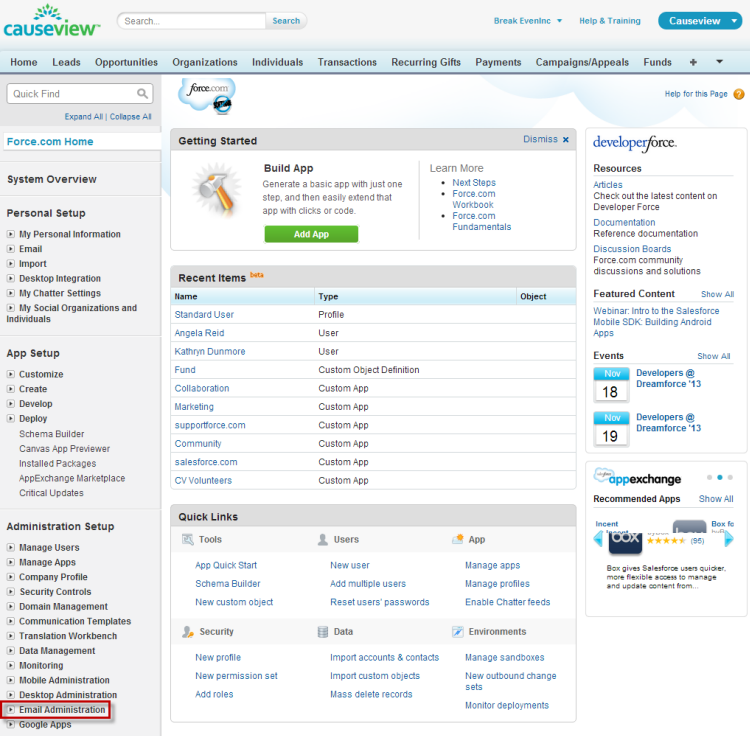 On the left side of the screen is a list of links which act as a menu for the many setup pages which allow you to configure and manage your Salesforce.com instance. 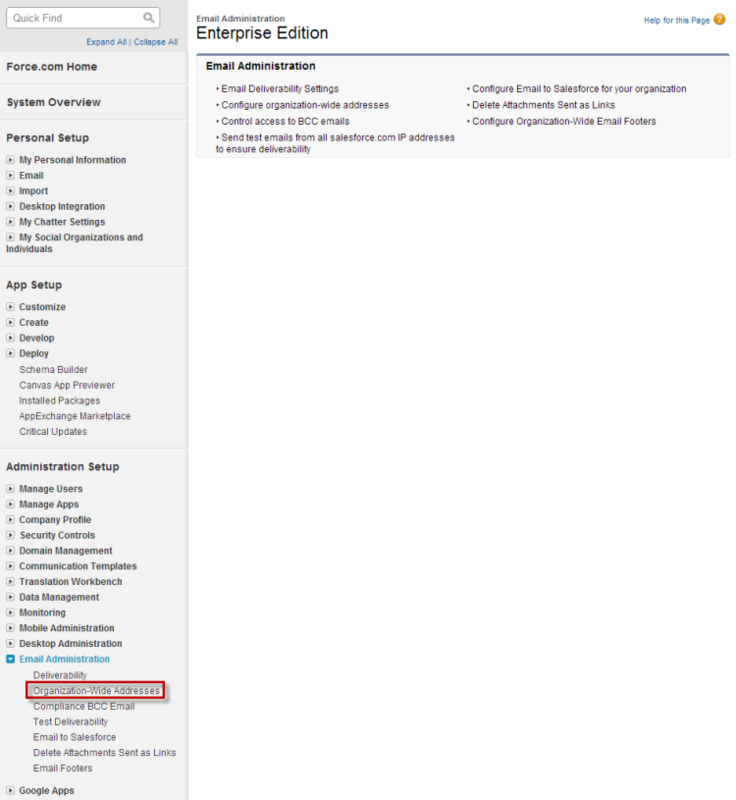 Find the “Administration Setup” section of the list, and click on “Email Administration”. Clicking on Email Administration will open an email management page in the center of your screen. It will also expand a menu on the list of links to the left, so that more options are available below “Email Administration”. Click on the second item in the list, “Organization-Wide Addresses”. A list of all organization-wide addresses for your instance of Causeview will now open. If you are configuring this address for the first time, the list should be empty. In order to add the org-wide email you have decided to use, click the “Add” button. The add button will open a new organization-wide email address profile. In order to save the address, you must complete the two required fields. The “Display Name” will appear as the name in the “From” field of all issued email receipts, and the “Email Address” should be the email chosen as your org-wide address for issuing receipts. 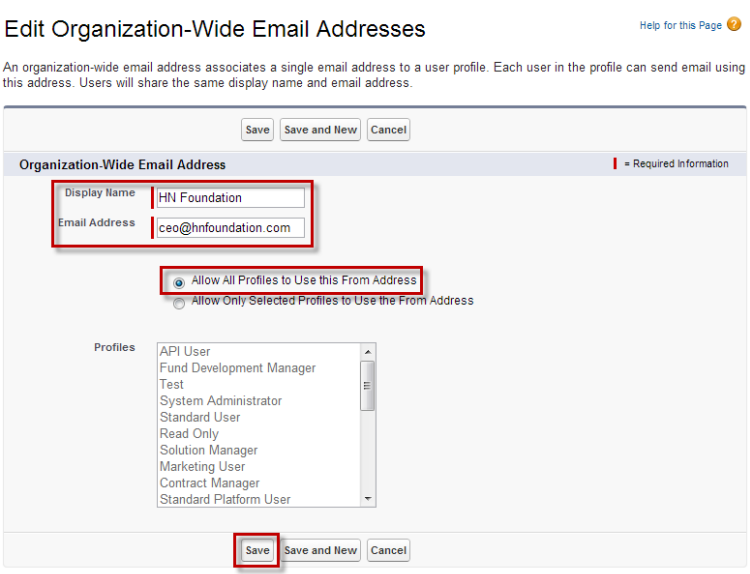 You can then select which Causeview user profiles are able to access the org-wide address you create. In most cases, you can select “Allow All Profiles to Use this From Address”, to avoid permission conflicts for different Causeview users. Once you have finished the org-wide email set-up, click “Save”. Once the email is saved you will be redirected back to the list of all org-wide addresses for your instance of Causeview. The new email will appear on the list, and the status will be set to “Verification Request Sent”, with the current date and a button which will allow you to resend the verification if needed. In order to use the new organization-wide email within Causeview you must verify that it is the correct email address, and you have access to the email. When the org-wide address is saved in causeview, a verification email is automatically sent to the email address with a verification link. The verification link will remain active for 72 hours, and can be re-issued if necessary. 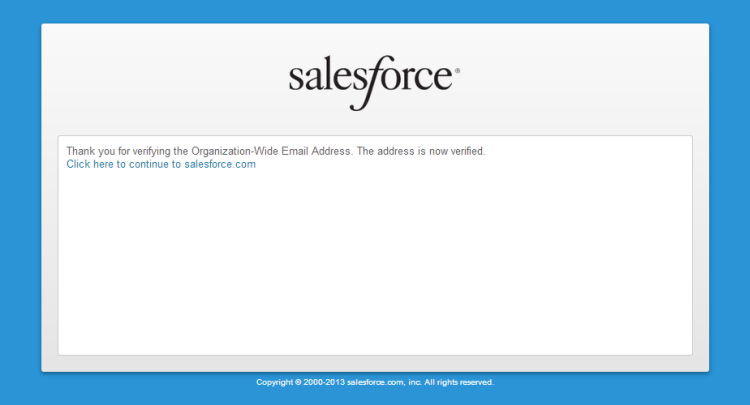 The email will come from the address support@salesforce.com. You should white-list this address for the org-wide email account. Once you receive the verification email, click on the verification link to confirm the address. You may have to re-enter your Causeview user login information. When the verification is complete, a confirmation message will be displayed. 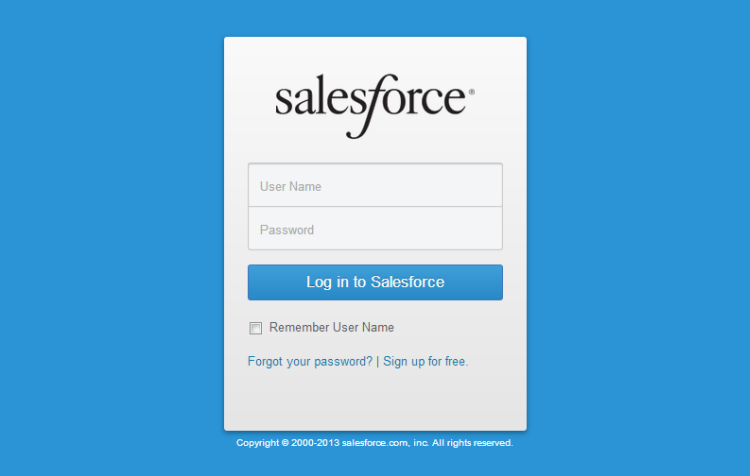 In order to confirm that your organization-wide address is confirmed, log in to Causeview at https://login.salesforce.com using the user name and password of a System Administrator account. Open up the “Setup” screen. Click on “Email Administration” in the list of links on the left of the page. Click on the second link listed under “Email Administration”, which is “Organization-Wide Addresses”. The list of all saved org-wide email addresses will be displayed. The org-wide email you have added should have a status of “Verified”.